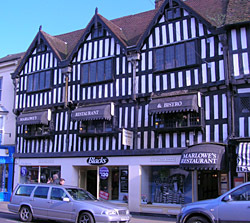 Stratford has many fine pubs and restaurants and with plenty of choice. Most of the pubs also offer dining facilities. Please look at our list of suggestions below to help you. 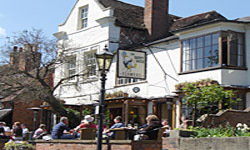 Rub shoulders with the actors from the RSC for a drink or a pub meal in one of Stratford’s most popular pubs. One of Stratford Upon Avon’s most historic landmarks, The Old Thatch Tavern is a beautiful Grade II listed pub dating back to 1470. The oldest pub in town, it stands as Stratford towns only remaining thatched building. 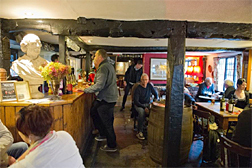 Inside is traditional pub fayre, exceptional ales and service. some of the finest food and cellar in the area. 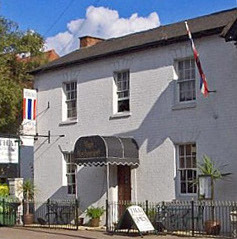 Once escorted to your table, you will dine in the same magnificent surroundings as have many famous actors over Marlowe’s long association with Stratford-upon-Avon and the Royal Shakespeare Theatres. Traditional oak panelling and ancient oak beams enhance the historic atmosphere enjoyed by Paul Schofield, Anthony Quayle, Vanessa Redgrave, Sir John Gielgud, Sir Alec Guiness, Sir Ralph Richardson and many others, whose kindly donated autographed photographs hang in our bar.